Make Your Own Dark Void Flash Game - This One's Mine! 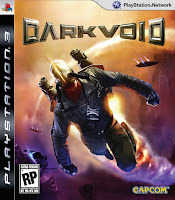 Dark Void is a new Rocketeer-esque game from Capcom that will be coming out next month. To help promote it they have done something pretty cool and interesting. Jetpack Attack! You can make your own sidescrolling flash game with the elements they provide for you. It is fairly flexible, depending on what you choose, and can get pretty damn hard. I made one of these little games and you can play it right down there. I warn you. Some areas have some Contra-like levels of frustration. Sorry in advance.